At the heart of US-China tension is the noticeable rise in China’s imperialistic behaviours: President Xi faces no re-election risk and can serve indefinitely; China has an assertive military display in the Asia-Pacific region; and its “Made in China 2025” program aims to re-fashion China into a global tech powerhouse. These factors alarm many US politicians about the US’s security and dominance in the world. A bipartisan consensus is emerging that the US needs to respond forcefully with the intention to curtail this Chinese imperialism. The US payroll figure on 6 July reflected continued improvement in the jobs market. More importantly, rising labour force participation is likely to keep a lid on wage gains and inflationary pressure. However, the picture is not as optimistic outside the US. US unilateral trade actions have also come at an inconvenient time for China, which is experiencing an economic slowdown. In turn, China’s slowdown adds to the emerging markets’ woes, as they are confronting fallouts created by their own political uncertainties. The irony of US unilateral trade offensives is that the country that has instigated the global tension is also the best place to invest in. With the global economy outside of the US doing relatively poorly, there is good reason to believe that the Fed will tread carefully in how it paces rate hikes. As 2017 has shown us, gradually pacing rate hikes doesn’t pose a problem for bonds. As international investors continue to exit emerging markets and look for safe havens to park their funds, demand for the US dollar and US government bonds could rise going forward. Current environment is relatively favourable for US-based equities and US government bonds. Short-term weakness in emerging markets and Asian equities are opportunities for mid and long-term investors to get exposure. Investors need to stick to their plans and average into a diversified portfolio with exposures to differentiated asset classes, sectors, and geographies. The trade disputes between the US and China have been going on for years, but these talks haven’t yielded substantial results between US and China on fairer trade practices. With talks back then and now seeing no progress, and with the current US administration being staffed with hardliners, it’s no surprise that the US is aggressively using trade tactics to cajole China into a speedier negotiation. Looking deeper, the true nature of the rumble between US and China is far deeper than just squabbles over market restrictions, intellectual property rights, and US trade deficits. At the heart of the issue is a noticeable rise in China’s imperialistic behaviours, which have raised concern in the US about its own security and dominance in the world. The US is now responding defensively and forcefully to curtail Chinese imperialism, while it still can. The first sign of a rise in Chinese imperialism comes from the fact that President Xi is now emperor-like. He faces no re-election risk and can serve his terms indefinitely. Adding to that are ample signs of more aggressive Chinese military display in the Asia-Pacific region, and that overlaps with China’s territorial claims in the South China Sea. Lastly, the “Made in China 2025” program has clearly alarmed the US. It aims to re-fashion China into a tech powerhouse with competitiveness in robotics, new energy-vehicles, chips, softwares, and other cutting-edge industries. The program has shown clear aspirations for China to dominate high-end technologies at the global scale. As we all know, technology is seen as a national treasure to the US, who is the current leading power in the world. Years of unfair trade practices and intellectual property breaches have enabled China to catch up quickly. It’s this “unfair” catch-up that’s causing Americans to view China as a national security and economic leadership threat when it comes to technology. While Trump’s method to protect the US’s global dominance is unorthodox, a bipartisan consensus is emerging that the US needs to stand up to China forcefully now. Even the democrats are encouraging Trump; Senate Minority Leader Chuck Schumer, a democrat, has criticised Trump for not being tough enough on China. That says a lot about the rampant “fear of China” sentiment in Washington. The payroll figures released on 6 July reflected continued improvement in the US jobs market. Labour force participation rate has risen from 62.7% to 62.9% which means that there are more people who previously left the workforce are now looking for jobs and getting hired again. There is still slack in the labour market for the economy to absorb, and this, in turn, is likely to keep a lid on wage gains and inflationary pressures. In short, the US growth is strong. The picture is however not as rosy outside the US and the trade war has come at an inconvenient time. By our estimates, growth in the US economy has significantly outpaced the global aggregate since September 2017. The global aggregate has been weighed down by China’s economic slowdown, which, in turn, makes emerging economies vulnerable as they are dependent on Chinese demands for their exports. The situation has created the irony that US, the country that has instigated the trade fights, is also the best place to invest in. On top of trying to deal with export impacts from China, emerging economies are also scrambling to manage the fallouts from their own local geopolitics. They are taking short-term measures to prevent the outflows of investors’ funds. If you look at Brazil, there has been an investor exodus so large that the central bank there has had to intervene in the currency markets. Turkey’s central bank has raised 1-week repo rates from 8% to 17.75% since 25 April. Basic economic logic tells us that high interest rates tend to kill growth; these measures depict just how desperate they are to protect the currency, even if it means sacrificing growth in the process. So how has the market reacted so far in 2018? 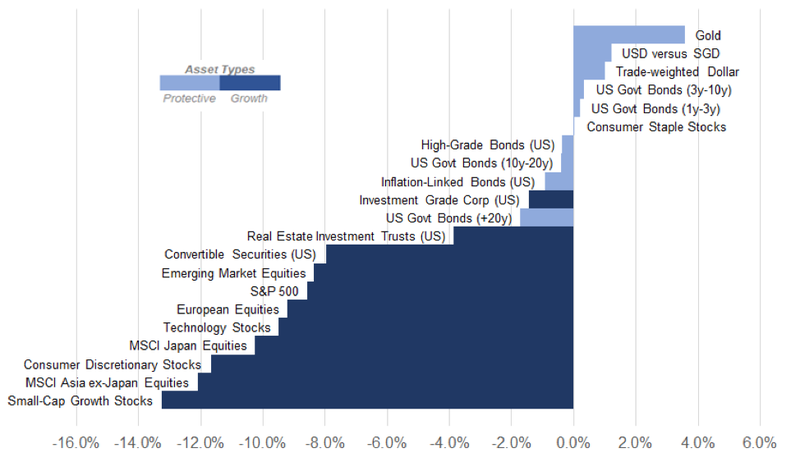 Not surprisingly, the top performing asset classes are all based in the US (see Figure 1). Stocks in the consumer discretionary, small-cap growth and technology sectors have led with year-to-date returns of +10.9%, +10.3% and +9.1% respectively. US convertible bonds have also performed well with 5.7% in YtD returns. In contrast, international equities did not fare well, with emerging markets, Asia ex-Japan, Japan and European equities returning -7.7%, -6.8%, -4.2% and -1.0% respectively. An exception to the stellar performance of US assets is consumer staples. The sector remains the worst performer in 2018 with a year-to-date return of -8.5%. The big issue for the sector is that it has to confront the impact of retaliatory tariffs. Currently, Trump’s unilateral action risk invites retaliations from China on farm products, such as soybean, sorghum, corn, wheat, rice, beef, pork, poultry, fish, dairy products, nuts, and vegetables. As it is difficult to pass on fully the cost of tariffs to consumers, these costs could eat into the profit margins of companies in the consumer staples sector. Having said that, markets may have overreacted to risk of tariffs, causing the valuation in the consumer staples sector to now be substantially below fair. From a portfolio management perspective, the consumer staples sector can offer good diversification during economic contractions, so there are long-term benefits to having some allocations to the sector. US government bonds have underperformed so far in 2018. As shown in Figure 1, returns were neutral to slightly negative with SHY(1-3 year), VGIT(3-10 year), TLH(10-20 year) and TLT(20+year) delivering YtD returns of +0.2%, -1.2%, -2.2%, and -2.5%, respectively. Looking forward, with the global economy outside of the US doing relatively poorly, there is good reason to believe that the Fed will tread carefully in how they pace rate hikes. In addition, the demand for US Dollar and US government bonds could rise as international investors repatriate funds out of emerging markets. We have started to see this trend in May and June where SHY, VGIT, TLH and TLT gained +0.4%, +0.8%, +1.5% and +2.6%, respectively. On a separate note, current strength in the US Dollar has caused Gold to underperform in the near term. The precious metal has a YtD return of -4%. Having said that, a diversified portfolio should always maintain a sufficient amount of protective assets to act as risk-reducer. Further, the undervaluation of Gold is actually attractive for a long-term investor. Trade tensions and geopolitics have dominated headlines, and the Chinese economy slowing, making the current environment relatively favourable for US-based equities and US government bonds. However, it is important not to lose sight of what really matters. Short-term weakness in emerging markets and Asian equities are opportunities for mid and long-term investors to get exposures. The right strategy is for investors to stick to their plans and average into a diversified portfolio with exposures to differentiated asset classes, sectors and geographies.